The new Nicaragua Canal is to be 134 miles longer than the Panama Canal, now working to capacity. Route will cost a billion dollars and will utilize huge Lake Nicaragua. See the map below. Details showing how the ocean is to be moved to 400 Great Lakes seaports through the building of the St. Lawrence Deep Seaway! This article summarizes progress on three big seaway projects. A STAGGERING appropriation of almost two billion dollars may be made soon by our Uncle Samuel for the building of two urgently needed, gigantic canal projects. They are to connect the most strategic commercial waterways in the world. Both plans have immense international interest. Number one, known as the Nicaraguan canal project, proposes to construct a canal that will make a seaway clear across the little republic of Nicaragua. Plan number two, possibly the most vitally needed and nationally interesting, would extend the sea base of the mid continent of North America so that the 400 harbors of the Great Lakes, world famous for the enormous tonnage they handle so efficiently, would actually become seaports, available to all ocean carriers. This is the building of the St. Lawrence-Great Lakes Deep Seaway, which would make the ports of the Great Lakes doubly valuable as carriers of America’s vast inland commerce and simultaneously as world channels of trade. A third project, receiving favorable national approbation, is known as the Riker Spillway, of which more later. The United States’ present keen interest ill the proposed Nicaraguan Canal arises from the surprising fact that the far-famed Panama Canal has not lived up to its much advertised expectations. During the last six years its commerce has doubled, and is now close to its capacity tonnage of 50,- 000,000 tons per year, so that there is every indication that the canal will shortly be unable to take care of its traffic requirements, All of which means, of course, that our government must act immediately to remedy the alarming situation. We are accustomed to think of the Panama Canal in terms of great size. But its distance from coast to coast is 134 miles shy of that which would prevail in the case of the Nicaraguan Canal. Moreover, the estimated cost (not yet accepted as official) for the new canal, is close to a billion dollars, as compared with $386,000,000 for the Panama Canal. This great expenditure, however, would be well worth while, advocates of the Nicaraguan project believe. They say it would save a day’s sailing time from New York to San Francisco and about two days from New Orleans to the Golden Gate— in other words, that the canal would afford great economic advantages as a shorter route between the Atlantic and Pacific coasts of the United States, and also between the Gulf and Pacific ports. Furthermore, it would offer splendid prospects for development of a more profitable trade with Central America. 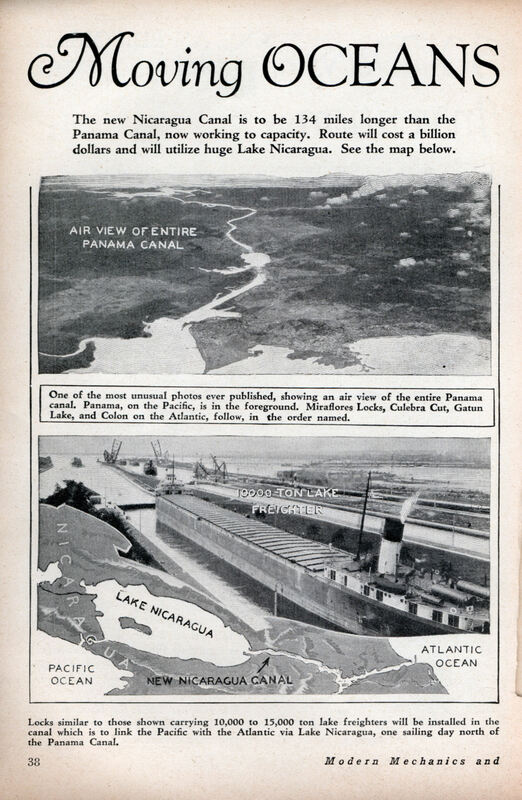 The canal, in fact, would permit a shortened schedule for nearly 80 per cent of the shipping which now goes through the Panama Canal. From the strictly military point of view it has been pointed out by both Army and Navy experts that such a new waterway (see map) could be effectively defended and would give our naval and merchant fleets the insurance of two means of passage from ocean to ocean. Curiously enough, the idea for the Nicaraguan Canal turns back the pages of American history 40 years, long before the Panama Canal came into being. It was in 1889 that Congress granted a charter to the Maritime Canal Company for the furtherance of such a project, though it fell through at that time due to pressure on the part of certain South American interests. The first really practical step for the canal’s realization was paved back in 1914 during President Wilson’s regime when there was signed at Washington a special treaty between Nicaragua and the United States. This country paid $3,000,000 for “the exclusive proprietary rights for the construction and operation of an interoceanic canal by a Nicaraguan route . . . whenever the construction of such canal shall be deemed by the United States as conducive to the interests of the two governments.” The World War cut short American development plans. Concerning today’s situation—it is true that thus far Congress hasn’t appropriated much money for a thorough investigation of the proposal. The sum of $150,000, granted for the purpose of a survey last March under ex-President Coolidge, is a mere drop in the bucket. Nevertheless many government engineering experts confidently expect that President Hoover with his broad knowledge of national needs will soon see to it that the canal gets a start on a worth-while scale. National interest in a shipway of sufficient depth to permit ocean shipping from the Great Lakes to the Atlantic Ocean has been widespread for 9 years. Midwestern industrialists and the 40,000,000 inhabitants of the world’s bread basket are clamoring for its completion. In 1920 an international board of engineers was appointed by Canada and the United States to make a survey of the St. Lawrence from Montreal to Lake Ontario in order to discover how best to make the waterway navigable for ocean and lake vessels. In 1921 the experts made a favorable report and in 1924 the two governments appointed another board of engineers to review the earlier board’s report. 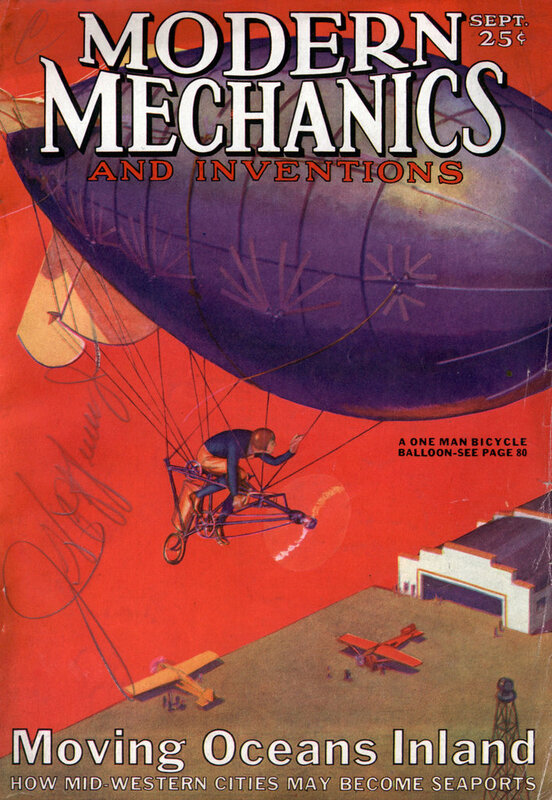 In 1926 the new board’s report showed the engineering factors to be very acceptable to both governments. Also in 1924 the two governments appointed advisory committees to further investigate the economic phases. President Coolidge’s committee was the St. Lawrence Commission of the United States with the then Secretary of Commerce, Herbert Hoover, as chairman and Charles P. Craig as executive secretary. Since then there has been a wide interchange of letters between this country and Canada. The next step, which seems to loom in the near future, is the appointment of an international commissioner or commissioners to phrase a treaty between the two nations. The five Great Lakes are international waters which form the boundary between the United States and Canada from Minnesota to New York. Considered from the standpoints of their area and commerce they constitute the most important fresh water group in the world. They are directly concerned with the prosperity of over 40,000,000 Americans and afford access to regions notable for the magnitude of their natural and industrial resources. THEY permit the grain of the western prairies and the Canadian provinces to reach eastern mills and ports of export at substantial savings compared with all-rail routes. They have brought into economic juxtaposition the ores of Minnesota and Wisconsin, and the steel mills of the Lake Michigan, Lake Erie and Pittsburgh districts. And they have enabled the Northwest to secure, at very great savings, the fuel required for the maintenance of its commerce, industry and domestic life. To further develop these great waterways on a large scale would be a masterly stroke of modern-day engineering genius. Moreover, the deepening of the St. Lawrence would also involve the development of the huge hydro-electric power from the great rapids which now obstruct navigation on the river. This is the largest profitable hydro-electric power development on the North American continent and the dams necessary for further increase of power would create a series of pools in place of the present rapids, which, with the supplement of locks and short canals, would constitute the shipway. That the interior states, as well as the others, believe they would be affected by the project, is shown by the fact that 23 states have associated together by acts of heir legislatures under the name of the Great Lakes Tidewater Association. Representing close to two fifths of the nation’s entire population, the organization is working heroically to accomplish its purpose. Actual construction will be apportioned between the two countries as follows: as tentatively proposed by Canada and assented to in principle by the United States, the proposed works lying within international waters shall be constructed by the United States, whether lying on the American or Canadian side of the line, and all works within Canadian waters shall be built by Canada. In other words, the United States will bear the expense of deepening the connecting channels between Lake Superior and Lake Erie and construct the proposed works in that portion of the St. Lawrence River from Lake Ontario to the point where it ceases to form the international boundary. Whereas Canada, at its own expense, will complete the new Welland Ship Canal (probably by 1930) and will build the proposed works in that section of the St. Lawrence lying between the international boundary line and the sea. As to cost, the United States will have to pay in the neighborhood of $123,000,000 while Canada will spend about $200,000,-000. It is expected that the seaway would be open to navigation in seven to eight years from the time that active work had been started. NOW as to the third project, the Riker Spillway. Down in the lowest depths of the historic Senate Office Building in Washington, D. C, a gigantic engineering model of the Riker Mississippi Spillway stretching some 75 feet long and about 12 feet wide, serves as a working plan of a waterway expert, Carroll L. Riker, whose age has passed the 80 year milestone. His model represents a plan designed, after almost a quarter of a century of intensive study, to make a docile infant of the turbulent Mississippi, controlling its treacherous floods, making its vast power far more available to the nation, affording well nigh perfect drainage, irrigation and better climatic and health conditions throughout the valley. Riker, a kindly, patriarchal man who has spent the best years of his life studying dam construction, explains that as far back as the years immediately preceding the World War, he had succeeded in interesting certain of Uncle Sam’s waterway experts in plans for the curbing of the Mississippi and its tributaries. But the war upset these plans to such an extent that not until recent years did government authorities again lend an ear of uninterrupted interest. Back in 1928, Congress, forced to action by the disastrous floods that had been exacting such a terrific toll of life and property, appropriated $325,000,000 for control of the Mississippi’s flood waters. But the scheme thus far hasn’t shaped up as hoped for by Congress, particularly since a recent break in the work resulted in virtually desperate efforts to prevent breaks in levees at other points. So Riker, backed up by Senator Lynn J. Frazier of North Dakota, among other prominent persons, is agitating the building of the huge spillway. Now the term, spillway, as the name implies, means a scientific “spilling”, or taking care of flood waters, so that they can do no damage. And in a word, the Riker plan proposes to accomplish this by virtue of the engineering process of quickly disposing of excess waters by deftly sluicing them to one side, though in as straight a line as possible, and then to the point of delivery. Under the Riker plan, a strip of land from Cairo, 111., to a point 150 miles west of the mouth of the Mississippi, three miles wide, would be confined on each side by an embankment, or levee of great size and width, divided laterally into two halves by a third levee. By such division, one levee could be used for navigation while another could be employed for agricultural purposes. Or it even could be kept dry for years, if emergency occasion so demanded. The land on which the strip is located could be purchased readily by the Federal government from the states which it traversed at a reasonable price. This wide spillway, running almost in a straight line to the Gulf, proponents of the plan say, would forever do away with the menace of floods. For it would tap the Mississippi near Red River Landing and receive all its excess waters there, and act similarly where it crosses the river above Vicksburg, recrosses it below Memphis, and at a point just below Cairo. Now comes what certainly are the most unique phases of the Riker project: the inventor claims that his spillway, or Overland Seaway, as some choose to call it, might within a comparatively few years be the greatest man-made navigable deep-waterway in the world, reducing by 50 per cent the water-route distance between the Gulf and Cairo, 111., as compared with the present distance by river alone, and largely supplant the latter for navigation use. The point that almost staggers the imagination in this connection is that not only will there be locks for small vessels, but that the Riker plan also calls for locks more than twice the length of those of the Panama Canal. In other words, the space between the levees would be dredged to a depth sufficient to permit the largest steamships in the world to regularly navigate the river’s entire length from Cairo down to the Gulf. Thus the city of Cairo would be brought to within 48 hours of the Gulf. In fact, Mr. Riker says: “My plan would practically make Cairo a seaport. It provides slack water for navigation, having a minimum depth of over 40 feet over the locks, an entirely ample width clear to the Gulf of Mexico, where there is the finest harbor entrance in the world both as to depth and approach. There is even a rattling good probability that if my scheme were carried out, the commerce of Cairo should, within 50 years’ time, become greater than that of any other port in the world. “The Mississippi Valley, being the geographical center of the United States, is destined to become its primary center of agriculture, industry and commerce. All this should be largely accomplished by my Hood control plan As demands have compelled many of our great industries to undertake their production near areas of consumption, such production designed for export will eventually cause their centralization where the best facilities exist for exportation and for obtaining raw material and labor. THE inventor points out that once the Riker Spillway were completed (granted that Congress eventually gives approval to its construction), work upon the Mississippi, looking to its complete canalization, should begin; first, by the construction of the master dams across the river; one just below the spillway’s mouth near Cairo; one just below where the river is crossed near Memphis; one below the recrossing near Vicksburg; and also one below where the river is connected with the spillway near Red River Landing. These master dams, Mr. Riker further explains, should be provided with gated control of the waters passing down the river, with locks for navigation and with plants for the generation of electric power. It’ll be underutilized anyway, once global warming opens up the Northwest Passage permanently to container ship traffic. Given the rather complicated relationship between the US, United Fruit, and Nicaragua (the latter was occupied by the U.S. almost continuously from 1912 through 1933) it’s actually a bit surprising this wasn’t built then. Maybe the US enjoyed their canal monopoly and let this plan wither away. If it hadn’t been for several very strange quirks of fate, political chicanery, a persuasive Frenchman, and a coup sponsored by American businessmen, the Canal would have been in Nicaragua. Practically right up to the moment the US government took over the sites of the old French digs in Panama, everyone thought that Nicaragua would be the place. Longer, and greater elevation changes, but much less miserable territory to work in, a more stable (at the time) government, and better geology. If you ever have the chance, David McCullough’s “The Path Between the Seas” is a fantastic read on a subject that changed the world in many ways. I always thought the original Nicaraguan canal was quashed because of that Nicaraguan stamp showing an erupting volcano. That’s the story I heard anyway.